The supernova SN 2014J is a Type Ia supernova first detected in January 2014 in the Cigar Galaxy (Messier 82), in Ursa Major. SN 2014J is the nearest Type Ia supernova event observed in the last 42 years. It reached peak magnitude of 10.5 and was bright enough to be seen by amateur astronomers. The supernova was discovered by chance, during a teaching session at University of London Observatory, on January 21, 2014. It stopped brightening on the last day of January. Images of Messier 82 taken before the discovery showed the supernova as early as January 15. Astronomers have been unable to identify the progenitor star and may never be able to do so because stars that end their life in Type Ia supernova explosions are usually white dwarfs in binary systems, not nearly luminous enough to be seen from a distance of over 11 million light years. Astronomers would have been able to pinpoint the companion of the white dwarf if it had been an evolved bright giant and not another white dwarf, a star still on the main sequence, or a fainter giant star. Type Ia supernovae are important to astronomers because they make excellent “standard candles,” a way to measure distances and the rate of expansion of the universe. A white dwarf that accumulates material from a binary companion has to reach a very specific mass to explode and, as the threshold is always the same, Type Ia supernovae always explode with the same amount of energy and their distance can be measured no matter where they occur. SN 2014J was discovered by astronomer Steve Fossey while he was training undergraduate students to use the CCD camera on a small telescope at University of London Observatory. Spiral galaxy Messier 82 has long been known for its remarkable starburst activity, caused by interactions with its near neighbour Messier 81, and has been the subject of intense study for many years. On 21 January 2014, astronomers at the University of London Observatory in London, UK, pointed their telescope at the galaxy and spied something peculiar… an intensely bright spot seemed to have suddenly appeared within the galaxy. This bright spot is actually a new supernova known as SN 2014J — the closest supernova to Earth in recent decades! Since its discovery, SN 2014J has been confirmed as a type Ia supernova, making it the closest of its type to Earth in over 40 years (since SN 1972E). This new NASA/ESA Hubble Space Telescope image is set against a previous mosaic of Messier 82 from 2006 (heic0604a), and shows the supernova as an intensely bright spot towards the bottom right of the frame. Type Ia supernovae are even more exciting for astronomers, as they have particular properties that we can use to probe the distant Universe. They are used as standard candles to measure distances and help us understand the scale of the cosmos. Catching such a supernova so soon after its explosion is very unusual; this early discovery will enable astronomers to explore its evolution in great detail, and to potentially infer the properties of its progenitor star. Messier 82 is several times more luminous than our Milky Way. Because it is only 12 million light-years away, it is one of the brighter galaxies in the northern sky. It can be found in the constellation of Ursa Major (The Great Bear). Image: NASA, ESA and the Hubble Heritage Team STScI/AURA). Acknowledgment: J. Gallagher (University of Wisconsin), M. Mountain (STScI) and P. Puxley (NSF). On January 21, Fossey and his students discovered a new star in their images of the Cigar Galaxy. They compared the new images with archival ones and observed the supernova with a second instrument to ensure that it was really there. They reported the discovery to the International Astronomical Union. 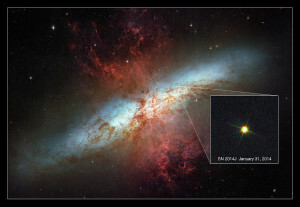 The IAU subsequently confirmed that it was a new discovery and assigned the supernova the name SN 2014J, as it was the tenth supernova detected in 2014. Supernova 2014J occurred at an approximate distance of 11.5 million light years from Earth. It is the nearest Type Ia supernova observed since SN 1972e in 1972 and the nearest supernova of any kind since 2004. In 2004, the supernova SN 2004dj was seen in NGC 2403, a spiral galaxy located in Camelopardalis constellation, approximately 8 million light years from Earth. In March 1993, the supernova SN 1993J occurred at almost the same distance as SN 2014J. SN 1993J was discovered in Bode’s Galaxy (Messier 81), located roughly 11.8 million light years from Earth. M81 belongs to the same group of galaxies as M82. A team of astronomers at Berkeley discovered some unusual characteristics in SN 2014J. The supernova brightened faster than other supernovae of this type and showed the same surprisingly rapid brightening as SN 2013dy, a supernova observed in 2013. One of the questions raised by SN 2014J is whether the supernova explosion was lit because a white dwarf had pulled too much material from a binary companion, a star similar to the Sun, or as a result of two white dwarfs merging. In a paper published in The Astrophysical Journal in July 2014, researchers noted that the region around SN 2014J was relatively devoid of material and that there were no X-ray emissions in the vicinity of the site of the supernova. If the progenitor star had been surrounded by enough material, it would have produced a bright X-ray source after the explosion. The lack of material around the site is unusual. It could be explained by a merger of two white dwarf stars. If this had been the cause of the explosion, there may have been relatively little mass transfer from one star to another and less material around the progenitor star. Another possible explanation is that there had been a series of smaller eruptions of the surface of the star, which had cleared the region before the explosion.